Bartow City Hall is located at 450 North Wilson Avenue, Bartow, FL 33830; phone: 863-534-0100. Photo: Lawrence Brown House, ca. 1892, 470 Second Avenue, Bartow, FL. Listed on the National Register of Historic Places in 2001. Photographed by User:Ebyabe, 2010, [cc-by-2.5 (creativecommons.org/licenses/by/2.5/deed.en)], via Wikimedia Commons, accessed December, 2013. Bartow, first settled in the 1850s, emerged as a political and commercial center in Polk County during the late nineteenth century. Designated as the seat of government for Polk County in 1866, Bartow experienced significant growth during the 1870s and was incorporated in 1882, but the town only began to grow dramatically with the arrival of the railroad two years later. Construction of the South Florida Railroad had begun in the same year that Bartow was incorporated, proceeding south from Sanford to Orlando and reaching Tampa in 1883. The Bartow branch of the line, which extended south from the mainline at Lake Alfred, was completed in late 1884. A year later, the Florida Southern Railway Company provided a second rail line connecting Bartow with Lakeland, making Bartow a rail center. In 1902, the both railways became part of the Atlantic Coast Line Railroad. The availability of rail transportation made a wide variety of agricultural enterprises commercially viable, particularly the growing of citrus. Previously the raising of oranges and grapefruit had been little more than a novelty, with little of the fruit from Central Florida reaching markets outside the state. The discovery and mining of phosphate in Polk County also stimulated development in Bartow. Although phosphate was mined in Florida in the early 1880s, large-scale exploitation of the mineral did not begin until the 1890s. Land pebble phosphate, the type commonly found in Polk County, was initially inferior in quality to the phosphate deposits located farther north. Within several decades, however, new refining techniques and the discovery of richer deposits improved the quality of that phosphate, which soon surpassed hard rock phosphate in price per ton. Phosphate was discovered near Bartow in 1883 during a survey conducted by the U.S. Army. In 1887, larger deposits were unearthed east of Fort Meade, and soon a rush ensued. In 1890, the Pharr Phosphate Company and the Florida Phosphate Company, both near Bartow, established mines, and the first commercial shipments from the area were made in 1891. By 1894, five companies were based in Bartow and nearly twenty additional companies were mining phosphate along the Peace River between Bartow and Port Charlotte. Sparked by its industries and the arrival of the railroads, Bartow experienced its first significant period of development during the last two decades of the nineteenth century. However, growth was still slow at first. In 1885, Bartow had only about twenty-five houses and a scattering of stores and other buildings. Commercial development centered around the courthouse square, located at the intersection of Main Street and Broadway Avenue, with dwellings located nearby. A fire in 1886 devastated much of the nascent commercial district, which was rebuilt in the following decades. 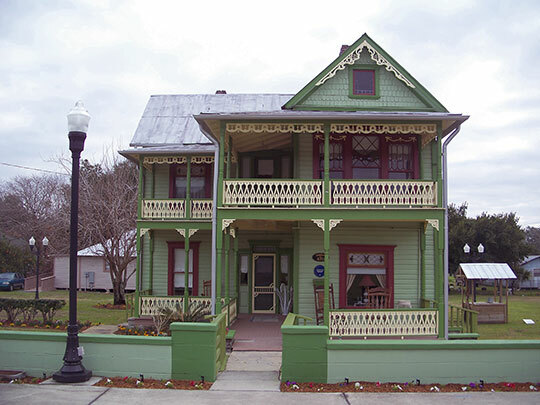 Despite its small size, Bartow by 1895 was the largest community in the county and had earned the nickname "Queen City" of Polk County because of its importance as a center for the railroad and the citrus and phosphate industries. The population of Bartow was nearly twice as large as Lakeland, the second largest community in the county. What had been a virtual wilderness in the 1870s had by 1895 become a rapidly growing community with constantly expanding economic base founded on citrus, phosphate, and railroads. The economic boom prompted expansion of the commercial district and the establishment of new residential areas. The construction of new houses south of the courthouse square began in the mid-1880s and accelerated in the early 1890s. By 1890, the population of Bartow had grown to 1,386. Five residential subdivisions had been added to the original town plat, and the community ranked as the thirteenth largest city in Florida. The growth of Bartow during the late nineteenth century was retarded temporarily by the nationwide financial crisis of 1893 and by hard freezes during the winter of 1894-1895 that devastated local citrus groves. Despite these difficulties, the city government and business leaders implemented steps to insure the health, safety, and quality of life in their community. In 1894, a home and building loan association was organized to help finance construction of new buildings in town. Oak trees were planted to improve the appearance of the city, and before the end of the century, the community had a municipal water system and electric power. The groves were replanted, and by 1900 the economic and physical growth of Bartow had completely recovered its momentum. W. Carl Shriver, Historic Sites Specialist, Florida Bureau of Historic Preservation, Architectural Resources of Bartow, Florida, nomination document, 1993, National Park Service, National Register of Historic Places, Washington, D.C.